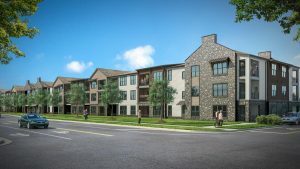 Laurel Street Residential announced a senior living development coming to Berewick in southwest Charlotte. With an expected delivery date of late spring 2019, Belvedere at Berewick will have 108 units and provide housing to adults 55 years and older. Rent will range from $1,000 to $1,500 per month and residents can choose from one- or two-bedroom units. The age restricted housing community is part of a 1,200-acre mixed use development site.